*Listed time and date are set to Japan time. *Count children that need a bed as an adult. **Children that do not need a bed will be added later in the reservation process. A charming traditional Japanese onsen town located in the mountain vallies of rural western Japan. 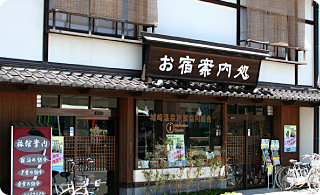 Kinosaki Onsen. Please enjoy your time exploring this traditional Japanese hotspring town. In addition to our friendly staff, who are knowledgable in English, and a warm welcome, we also offer maps and informational flyers about our town in English. Located near the entrance is a touch panel with internet access to better assist our guests. It is our mission to help make your stay as pleasant and relaxing as possible. Our staff is at hand to help you with any questions or concerns you may have. Whether it be a question about train times, how to get to your accomodations or how to use the bath houses, please do not hesitate to ask. To help guide you as you explore the traditional bath houses and local stores, you will find large maps located near the bath houses. 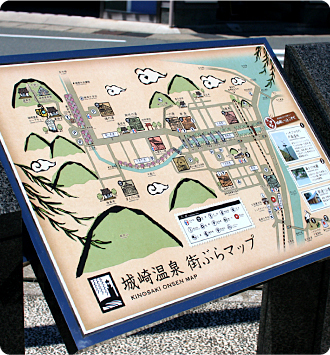 The maps are in Japanese and English, indicating where the bath houses and other points of interest are. Along with maps of the town, you will also find billigual sign posts pointing you in the direction of the bath houses and other parts of the town. We are easy to find. As you leave the station keep walking straight past the bus and taxi pool. We are located accross the street. 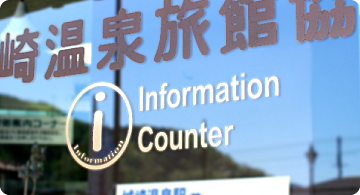 Look for the “Information Counter” printed on the front window. We are open everyday from 9:00am to 5:00pm. 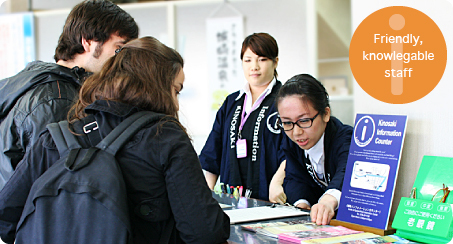 Also, check us out on Kinosaki Onsen Tourist Information's facebook page. Here you will find information on local events, weather and more. Copyright (C) 2011 KINOSAKI INN CONCIERGE All Rights Reserved.